How to achieve keto weight loss using this step-by-step keto weight loss plan geared toward women on a low-carb diet. Every woman knows the struggle. It seems to creep up, out of nowhere. One morning, as you’re pulling up your jeans, you struggle just a little bit more than you used to. You cringe a little when you see what your arms look like in that picture your friend posted to Instagram. You just don’t have as much energy as you did last year. You realize whatever you’re currently doing isn’t working and you decide to go on a diet. The thing is, you don’t just want a quick fix, you want a diet that will make a lasting difference. So you choose the keto weight loss plan. To help you dive into keto weight loss, I’ve developed a comprehensive guide. By the end of this keto weight loss guide, you’ll have everything you need to get started on the ketogenic diet to lose weight the right way—for the long term. But before we get to all the keto goodness you may be asking yourself, what is keto? Keto is a low-carb eating style that encourages your body to burn fat as fuel instead of sugar. Every carbohydrate you eat is transformed into sugar in your body. With ketosis, we rely on fat instead, using the fat on our bodies or the fat in our food to provide energy. Diggin’ the content? 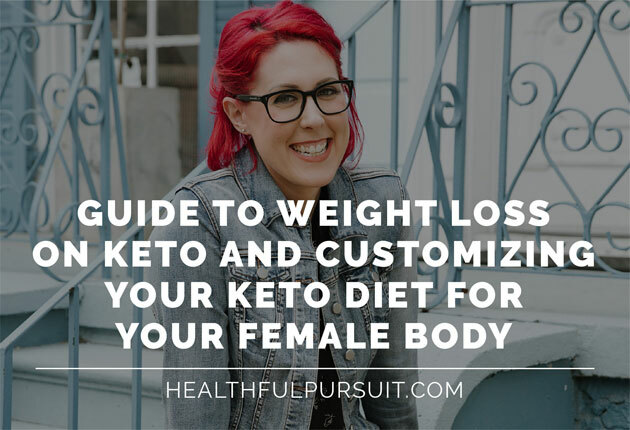 Check out the two other posts in this keto beginner’s guide series on How The Keto Diet Is Different For Women and Ketogenic Diet Problems & Solutions for Women. The average person’s body relies on carbohydrates or glucose, as energy. On a ketogenic diet, however, the body enters into a different metabolic state—ketosis. In this new metabolic state, the body shifts its primary source of energy from glucose (carbs) to fat (either the fat you eat, or the fat on your body). In order to accomplish ketosis, or the burning of fat instead of glucose, a ketogenic diet lowers the daily carbohydrate and sugar intake. Basically, because there is very little glucose, the body is forced to identify another source of energy. The body does very well in a state of ketosis because most people have plenty of fat energy stored in their body at all times—roughly 50,000 calories of it, in fact. Moving your body into a state of ketosis does more than just shift its primary source of energy. Because you feed your body less carbs and sugar, your stores of glucose or glycogen are reduced. This, in turn, lowers your blood sugar and insulin levels. So first, you remove the excess carbs and sugars from your plate, then your body depletes its glycogen stores, stabilizing blood sugar and insulin. Then, your body turns to fat as an alternative fuel source, burning up excess fat stores. For a keto woman, keto weight loss becomes effortless. 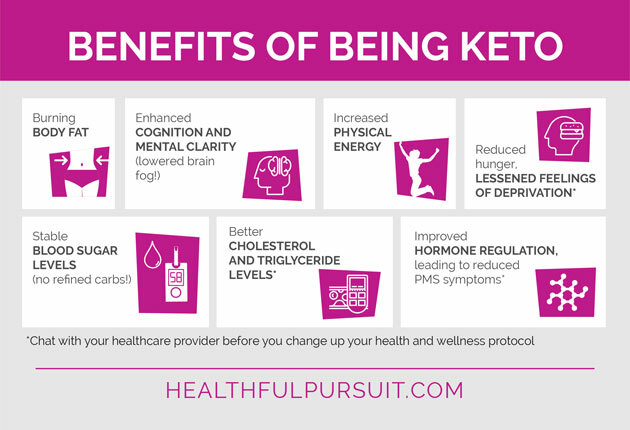 The great news is that weight loss is just one of the benefits of ketosis. A ketogenic diet can be used to help treat everything from epilepsy to diabetes to cancer. The key is the production of ketones–without ketones, there is no ketosis. Ketones are produced when fat becomes the body’s main energy source, and this is the main purpose of a ketogenic diet. 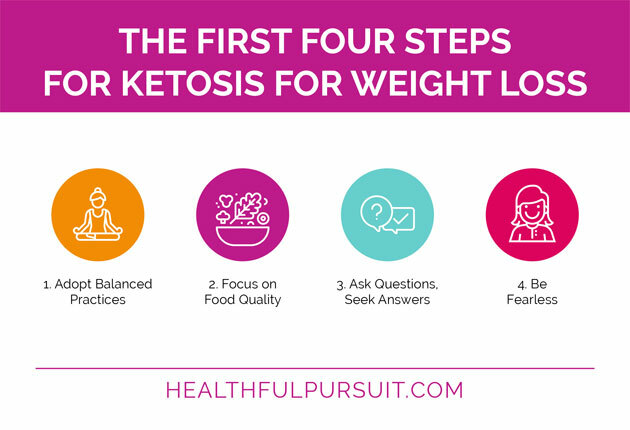 For keto women on a weight loss journey, ketones are key–glucose and ketones are the only fuel used by the brain, so when we remove glucose, ketones are the only option. Our bodies prefer to use ketones as a power source, and it has always been this way, dating back to our hunter-gatherer days. Many years ago, before our ancestors had developed the ability to domesticate animals and cultivate crops, they relied on hunting and gathering. This lifestyle meant that they ate less protein and carbs. Combined with the fact that they would regularly be forced to fast due to the scarcity of food, this meant that their bodies naturally ran on ketones. In short, it is innate, in all of our bodies, to convert stored fat to energy. This fat-burning mode that is hardwired into our body produces a metabolic fuel—ketones. Ketones are a supplementary source of power for the body, available for use when no glucose is accessible—these two sources of energy, ketones and glucose, are the only ones that the brain uses. Become a master at getting your body to its preferred fat-burning state. Acetoacetate: Produced first when long- and medium-chain fatty acids are broken down for energy. Acetone: Produced spontaneously as a byproduct of acetoacetate is produced. When not immediately utilized, both acetone and acetoacetate are dumped into the urine and breath, which is why you can test your ketones with urine strips or a breath meter! Beta-hydroxybutyrate (BHB): Technically, this is a molecule, not a ketone, but it plays an important part in ketosis! The liver creates BHB from acetoacetate. Unlike other molecules, BHB can move through the blood, allowing it to reach certain tissues that other molecules do not have access to. When it reaches the mitochondria, it transforms into ATP (adenosine triphosphate), which is what cells use for energy. In other words, BHB is energy, and even though this molecule is not technically a ketone, it is crucial to the ketogenic diet! Understand the science behind keto. 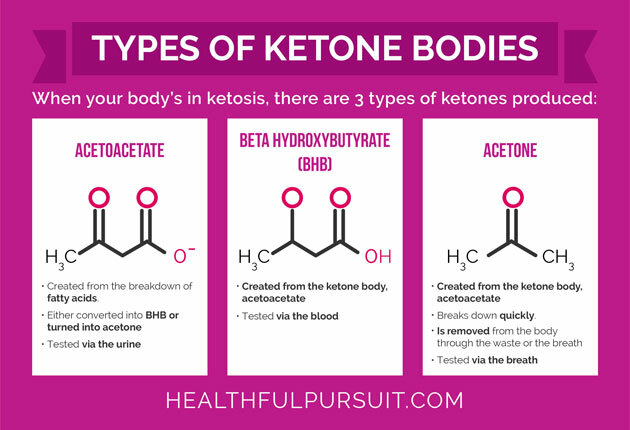 So, now that we’ve got a grasp on what keto is, what ketones are, and how it all works, let’s see how keto stacks up against other ways of eating for keto women with weight loss goals. There are three key differences between these two diets. The first is that while atkins relies on diet phases, keto doesn’t. The second is that with atkins, there is no limit on how much protein is eaten. With keto, protein consumption is much more moderated. The third is that atkins does not focus on the quality of food, while food quality is key in a keto diet. Paleo and keto are somewhat similar. The key differences include that paleo does not have to be a low-carb diet and that paleo does not have scientific markers for the body. A keto diet is low-carb and dieters have the ability to test whether they are in ketosis. Because these are the only key differences, though, fans of paleo can do a paleo version of the ketogenic diet, which is what I focus on in my book, The Keto Diet. These two diets are nearly exact opposites. It is possible for vegans to apply low-carb principles to their diet, but it’s rare—most vegan diets rely heavily on carb intake. The mediterranean diet is very similar to the vegan diet, with the exception of including some animal protein. Its high reliance on carbs distances it from the keto diet. Food quality should always be the focus of a balanced diet, keto included. Many people fall in love with keto because in addition to the therapeutic benefits of ketosis, they prefer how keto makes them feel mentally and physically. Again, weight loss is an added bonus triggered by the body utilizing fat for fuel instead of glycogen from carbs. *The various benefits described above can vary from person to person, depending on several factors like body composition and insulin resistance. That being said, keto consistently leads to weight loss, improved athletic performance, and lower body fat percentages in an array of situations, including those with patients struggling with obesity and type 2 diabetes. For personalized help in overcoming your body’s existing weight loss barriers, check out Happy Keto Body – the only keto membership program designed by women for women with contributions from a Naturopathic doctor. With over 21 hours of video content, a Facebook community for more support and encouragement, plus the option to join in on live group coaching calls, Happy Keto Body is the perfect keto membership program for women who want to live a ketogenic lifestyle for weight loss, health and healing, more energy and longevity. Check out Happy Keto Body and find your keto sweet spot today! The short answer is no. Many people misconstrue nutritional fat as something that makes you fat, but the truth is that healthy fats, like saturated fat from medium-chain triglycerides (MCTs), are easily converted into energy by the liver. A scientifically-proven example of how healthy fats work can be seen in medium-chain triglycerides and other saturated fats. These are transported directly to the liver and then used as energy. When the body relies on this type of reaction with a ketogenic diet that is high in good fats, it moves to a fat-adaptive metabolic state. Basically, this means that your body becomes really good at burning fat as energy and the longer you stay in this state, the more ketones you can produce, leading to more fat burning and weight loss. When we continuously utilize healthy fats as a fuel source, our bodies eventually reach a fat-adaptive metabolic state and become fat adapted. Being fat adapted means that your body is efficient at burning fat as fuel, and continuously produces ketones, which is the goal of a ketogenic diet. When your body produces ketones, you reap the benefits of ketosis. Get the low down on fats – from the awesome to the ugly, and everything in between. Plus, discover your ideal fat intake when you join Happy Keto Body – the only doctor-approved 12-week keto membership program for women. A ketogenic diet does include protein, just a more moderate focus. Because a ketogenic diet focuses on fat as the primary source of nutrition, protein intake is lowered. Keto is protein-sparing, which means your body doesn’t utilize protein as the energy source because it loves fueling with fat. Still, protein has a ton of benefits, and it’s an essential part of the ketogenic diet. Protein helps encourage increased calorie burning when at rest (muscle burns fat!) and promotes reduced feelings of hunger (protein is satiating!). You also need to eat protein in order to keep your organs functioning and retain muscle mass. The thing about ketogenic diets is that the decrease in carb intake is so sharp that it creates a shift in metabolism. Low-carb diets typically do not reduce carb intake enough to produce and burn ketones as energy. I would like to note, however, that some keto diets have a little wiggle room with protein and carb intake. Standard Ketogenic Diet (SKD): This is the most popular version of keto. 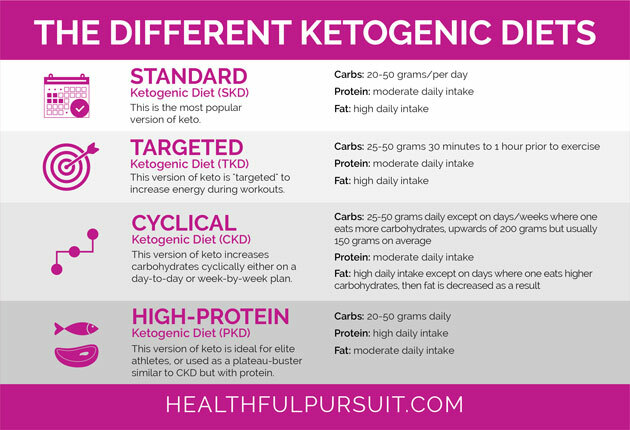 Targeted Ketogenic Diet (TKD): This version of keto is “targeted” to increase energy during workouts. Carbs: 25-50 grams 30 minutes to 1 hour prior to exercise. Cyclical Ketogenic Diet (CKD): This version of keto increases carbohydrates cyclically either on a day-to-day or week-by-week plan. High-Protein Ketogenic Diet (PKD): This version of keto is ideal for elite athletes, or used as a plateau-buster similar to CKD but with protein. How do you find out which approach is best? Discover the most effective macro intake for your body. Again, the primary focus of keto should be high quality whole foods. Many keto-ers tend to make most of their foods themselves to avoid processed foods. This isn’t as overwhelming as it seems: think bunless burgers and veggies smothered in homemade ghee. Just focus on high fat, moderate protein, and minimal carbs (coming from low-glycemic veggies). Macros: Does Intuitive Eating Work? The tricky part about keto is that it involves listening to your body. Lots of websites have information on different keto diets and various macro breakdowns, but this diet isn’t a one-size-fits-all. You need to adjust it to what you need. And above all, you must prioritize eating high quality food. Contrary to popular belief, calories are not the be all and end all of the ketogenic diet. Yes, calories matter — if you eat 5,000 calories in a day, even if none of them are carbs and few of them are protein, you’re going to gain weight. That being said, if those 5,000 calories come from quality, whole foods, your body is more equipped to utilize the nutrients, especially compared to 5,000 calories of Snickers bars, Burger King, and bottomless french fries. In the end, the quality of the food you eat, rather than the amount of calories they contain, is what matters the most. The first priority is to find out where you can get those quality calories. Start focusing on hormone-free grass-fed meats, greens, and quality fats high in MCTs like avocado oil and coconut oil. The second priority is to balance the macronutrients and identify how fat, protein, and carbs and the various combinations of the three affect your insulin levels. The goal is to ensure that your insulin never rises too high; if insulin escalates to a certain point, then fat burning (lipolysis) will stop. Understand that there is no magic fix to happiness, weight loss, or anything, PERIOD! Focus your energy on adopting balanced practices that promote healing for your body’s unique needs. Keto for healing should always be customized to fit your concerns. Keto is all about the quality of food you get, not counting calories. Continue to research and ask questions—of yourself and the health sources you trust. Unfollow people who might discourage you from your new journey and connect with people who will encourage you. Align with people who embrace item #1 and do so fearlessly! These four steps are not necessarily easy to follow, especially when you don’t see the pounds dropping off every week. Remember that healing is the goal of a ketogenic diet, and excess weight WILL come off as the body heals. Even individuals without specific health concerns often need to heal from the standard North American Diet, which has promoted insulin resistance for much of the population. Carb-heavy diets, high in refined carbs and sugar have trained our bodies to be dependent on carb heavy foods. Every time we consume pasta, bread, cereal, juice, sweets, and even the “healthy” foods, like milk, oatmeal, and fruit smoothies, our blood sugar is spiked. Continuous blood sugar spikes lead to insulin resistance, which can trigger a barrage of issues, including diabetes, weight gain, fatigue, cardiovascular disease, and even the more severe issues like Alzheimer’s and cancer! By taking a keto weight loss approach, you promote healing within the body and protect your future health. Yes, it will take time and energy for your body to switch over, but isn’t your health worth it? 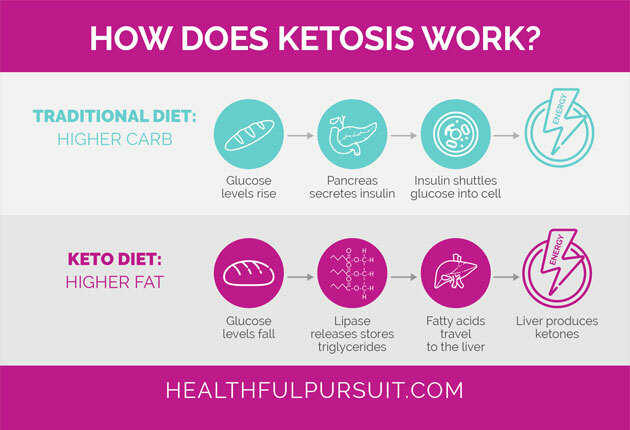 For customized, doctor-approved support on getting into and staying in ketosis (and virtually everything else you want to know about ketosis for weight loss and healing), check this out. Every diet comes with challenges, and not addressing them here would be irresponsible. So, here are some of the keto for weight loss questions I receive, and solutions you can use now to start feeling better today. My moods are all over the place. I’m worried keto will make it worse. If you can’t shake that feeling of discontent, your gut could be the culprit. The gut lays the foundation for your overall health; if your gut health is imbalanced, there’s a good chance that your overall health will feel off. Most digestive disorders and diseases are the result of an imbalance in digestion and your microbiome—your microbiome is your digestive tract’s environment of roughly 1 trillion bacteria and yeast cells (about 3 lbs). This means that with just a few adjustments in diet and lifestyle, you can prevent and treat these issues. To support the microbiome, you need to eat healthy fats, good protein, alkaline veggies, and a lot of fiber. Avoiding sugar is key for gut health, because sugar is a source of candida overgrowth and inflammation. The gut and brain are directly connected. Roughly 90% of serotonin is produced in the gut, rather than the brain—a gut that isn’t healthy doesn’t produce enough serotonin, leading to everything from depression to anxiety. Because your gut breaks down nutrients, absorbs them, produces some vitamins, and protects you from foreign bodies, it ends up playing a big role in your mental health, alongside your immune system function and the inflammatory burden in your entire body. If you’ve been sick and you just can’t shake it, look to the gut! About 70% of the immune system resides within the gut, so if your gut is imbalanced, there’s a good chance that your immune system is weakened. Weakened immune system is related to increased frequency of colds, flus and other infections and may play a role in the development of chronic disease. Discover the gut / brain / weight connection and how to heal your gut with a ketogenic diet. How much weight will I lose on keto? The short answer: it depends. You can help enhance your weight loss with exercise and cutting out foods like artificial sweeteners, wheat products and byproducts, and dairy. Some of the initial weight loss can be attributed to water weight, unfortunately, as ketosis has a diuretic effect—but this is a good sign because it means that you are successfully moving your body into ketosis. Want more good news? I have tons of keto-friendly recipes for you! Start your recipe search here! What’s the best way to track my carb consumption? Many people use MyFitnessPal, either online or through their mobile app. While MyFitnessPal doesn’t track your net carb intake, you can just subtract your total fiber consumption from your total carb consumption to get net carbs. Okay, but does macro counting really work? Podcast: Macros: Does Counting Work? Podcast: Macros: Does Intuitive Eating Work? How do I get back on track when I mess up? Slip ups are bound to happen, and the fact that you want to get back on track is a great first step. Getting off track isn’t the end of the world, just expect the scale to fluctuate for a few days (there’s a biological reason behind this, don’t fret!). What should I do if my weight loss is plateauing? Generally speaking, you should lose between 1 and 2 lbs every week, but sometimes this doesn’t happen, and you should know that weight loss is NOT linear — it goes up and down! Fluctuating is normal and can be a result of so many things, like alcohol consumption, hormonal changes, exercise, lack of sleep, and stress. Another thing to consider is body recomposition. You might be gaining muscle mass through exercise while losing fat; muscle is more dense more than fat, so while it may seem like you aren’t losing weight, your body is getting smaller. A good way to check this is by taking your measurements. If you go a month without losing weight, though, take a look at the following steps to get you on your way! Use coconut oil. Coconut oil is loaded with MCTs and contains lauric acid, which promotes ketone production* within the body. Up your fat consumption. I know this sounds weird, but remember how we talked about the body needing fat to utilize as fuel and promote healing? Make sure that at least 60% of your diet is coming from high quality, healthy fats, like olive oil, avocados, dark chocolate, eggs, or ghee/full fat butter. Give intermittent fasting a go. Occasionally fasting for 8-23 hours can boost ketone production and fat synthesis in your body. Give fat fasting a go. This is also called fast mimicking — you eat only healthy fats and your body believes it is actually fasting, so you get all the benefits of fasting while enjoying your favorite fatty foods. Get moving. Increasing your physical activity can help deplete your glycogen stores and raise your ketone production, promoting ketosis. Get enough protein. If you eat too much protein, your ketone production won’t be at a maximum. However, not eating enough can cause you to lose muscle mass and starve parts of your body that can’t rely solely on ketones for energy, like your brain, kidneys, and red blood cells. You need to balance protein intake carefully, and it may take some trial and error to find your happy place. Consume exogenous ketones. Exogenous ketones can help raise your ketone levels and fat intake with a nice dose of MCTs. Plus, they’re great for fasting, which is another awesome tool to break a keto plateau. Build a support system. A great place to start: join an online keto support group. 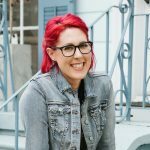 Even better, get into a membership program, like Happy Keto Body, that’s designed to educate and support women on keto – and includes membership to an online keto-for-women community where you can find encouragement, advice from keto veterans and motivation to stay the course when you’re tempted to give up. Check in with yourself. Are you struggling? Maybe feeling unhappy, unfulfilled, or just overall in a slump? There’s no shame in this — it’s part of being human! If you’re struggling, there could be a deeper cause. Do I have to stick with keto forever? There’s no hard and fast rule that can answer this question, it depends on your situation. For those who want to use keto for therapeutic reasons, it’s best to speak with your health practitioner. For those with a goal of weight loss, try a few weeks on the keto weight loss diet, followed by a few months on a paleo diet, and then switch back to keto and see how your body responds. Again, keto has so many benefits outside of weight loss, and many people stick with keto for the mental clarity and boost in energy. A lot of women ask me if it’s safe to stay in ketosis long-term. The answer depends on many variables. To discover the truth about how to do keto for life, check out Happy Keto Body – the only doctor-approved keto membership program for women. Inside the program, we’ll take a deep dive into everything I’ve ever been asked about keto for women, including how to eat this way long-term.